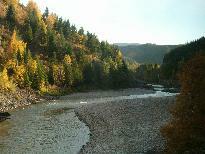 This train trip was an eagerly awaited journey for me, and one which I chose to take in September 2005. 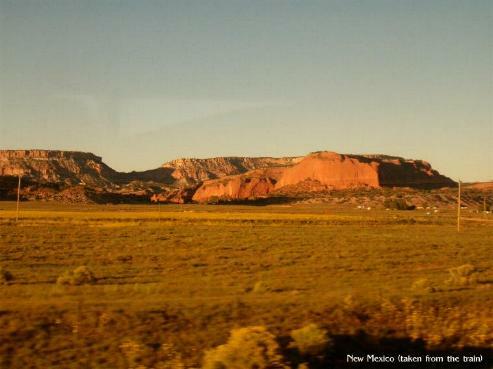 After a short drive (car rental from Enterprise from Colorado Springs to the train station at La Junta, CO), I boarded the Southwest Chief Amtrak train and overnighted to Los Angeles. Armed with my Amtrak 15-Day West Rail Pass (off-peak $210* from the Rockies and west for International travellers - see Amtrak for details on all Rail Pass Rates, both for international travellers and locals - there are lots to choose from), I set off on a semi-planned trip for two weeks—all I knew was in which direction I was going and more or less the stops where I wanted to spend a night or two, but no fixed dates. 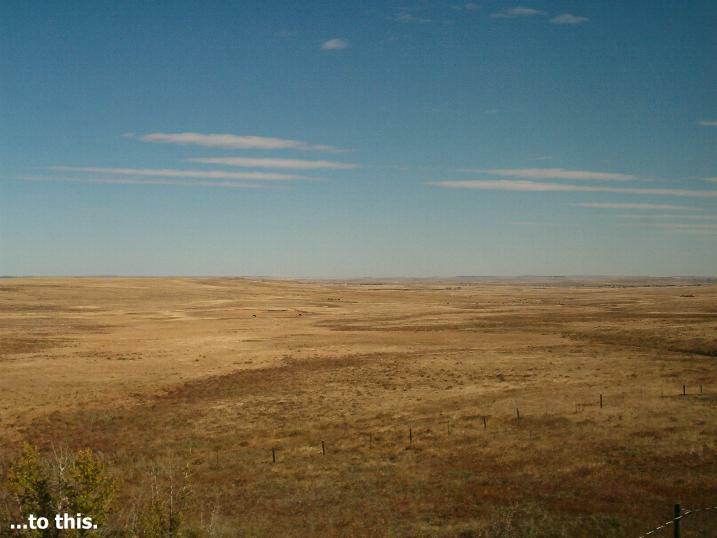 It was a beautiful morning and across the southern Colorado plains I saw buffalo, a lone fox, deer, and a coyote. About an hour into the trip you can see the Spanish Peaks on the right and in the distance - they are a gray granite and very pretty. We had a brief stop in Trinidad which is almost at the state line (New Mexico) before the train started climbing upwards towards the Raton Pass. You are quite close to the rock faces and the scenery changes dramatically from flat land to extremely mountainous and becomes extraordinarily beautiful. 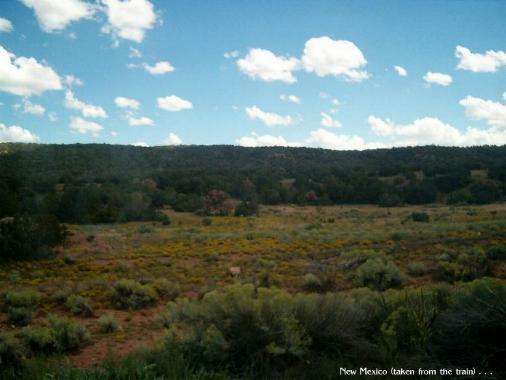 Just before Raton, NM, on the right, you'll notice a dusty trail which is the old Santa Fe Trail, and then you go through the Raton Tunnel at 7,588 feet above sea level. 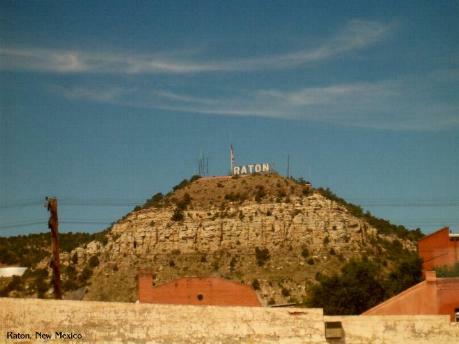 Just after the stop at Las Vegas, NM, and just before a place called Ribeira (according to the narration on the train), is where radio host Don Imus's farm is located. This is where he and his wife and his brother host children with blood diseases to come and have a good time. The scenery is gorgeous but there is little between towns and cities and some of the best scenery is about 45 minutes outside of Lamy where there are jagged red rocks and evergreen trees, some of which stand like ghosts - white and charred in death. Albuquerque is about an 8-hour trip and the first stop where you can get off and stretch your legs. 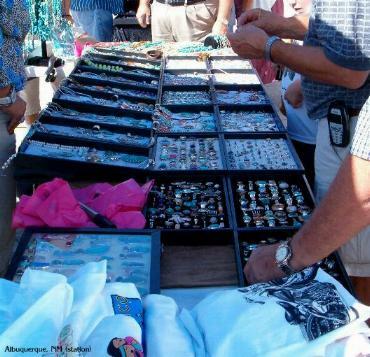 There is a stop of about an hour so there is time to dash into town for a quick look around or you can stroll along the platform and check out the vendors' goods on sale. 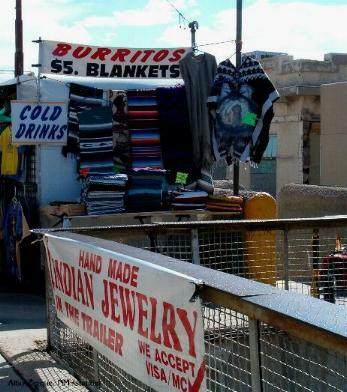 There were lots of handmade turquoise jewelry, blankets for $5 ($15* on the train), sodas for 75c ($1.75* on the train), and I bought a tasty beef and chile burrito for about $3. Needless to say I bought a few drinks and a burrito for my supper. It was stinking hot (86F or 30C "desert hot"). You can also mail letters and postcards on the platform. Around Gallup, NM, the sun was starting to set and the rocks were a soft pink and is really something to behold. Please don't nod off until it's dark outside or else you'll miss some spectacular scenery. The clocks go back around here so you have an extra hour. I followed my own advice this trip and brought along a little cozy blanket which folded up neatly and fitted in my little suitcase. What an extremely useful and handy thing to have had along. The trains can become a little cooler at night so my little blanket was perfect. I also brought along a travel pillow (smaller than the standard bed pillow) which also got squished into my suitcase and was a godsend and I had a fairly comfortable night. Arrival in Los Angeles, California, the next morning was an hour earlier than the scheduled 8.15 am, and all was quieter than I've ever seen Union Station. Not for long however, as people started arriving in their droves en route to work or elsewhere. I bought a Metro Day Pass from the machine for $3.00* (single bus rides are $1.25* each with exact change required) which allowed me unlimited travel on the buses and subway system. Passes can also be purchased on the bus but you must have the exact change. Pick up a map of the city (or print one out from the Internet) so you can see where I went. 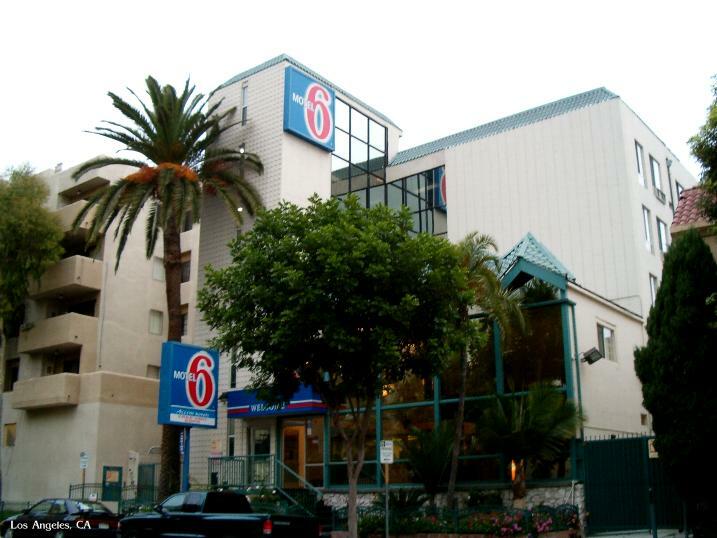 I was staying the two nights in Los Angeles at the Motel 6, where I'd stayed before. 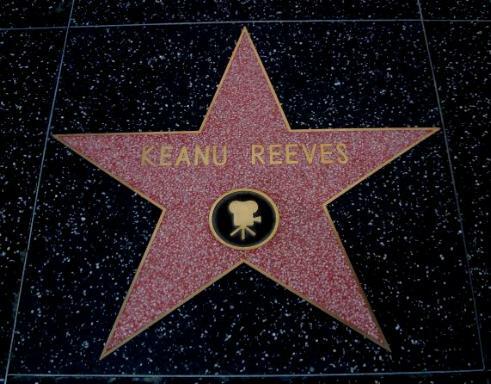 It's on the Red Line at the stop Hollywood/Highland and a few blocks along Hollywood Boulevard (at Whitely Ave) and is close to the Kodak Theatre and Grauman's Chinese Theatre. 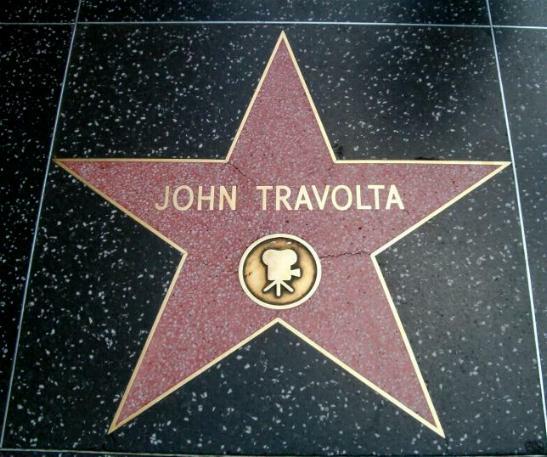 This is the street with the stars names on the sidewalk. Pick up a map at the frontdesk. I couldn't for the life of me find a bus route map so I asked the bus drivers which number bus I should take to get to where I wanted to be. 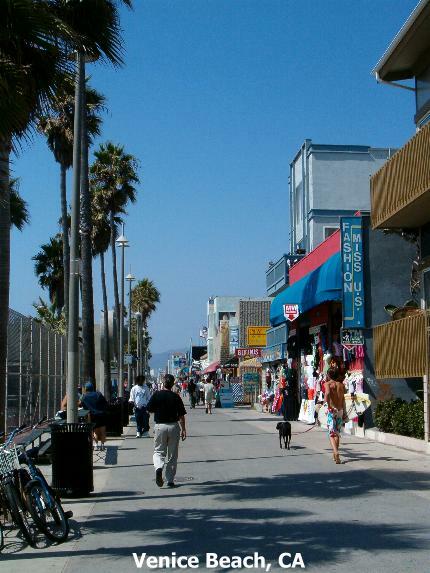 My first outing was to Santa Monica and I took the number 212 bus on Hollywood Boulevard (turn right on Hollywood Blvd as you come down Whitely Avenue and walk until you find a bus stop on the same side of the street) which went to La Brea and along Santa Monica Boulevard (as in the Cheryl Crow song) and took about an hour. L.A. is not a small place! 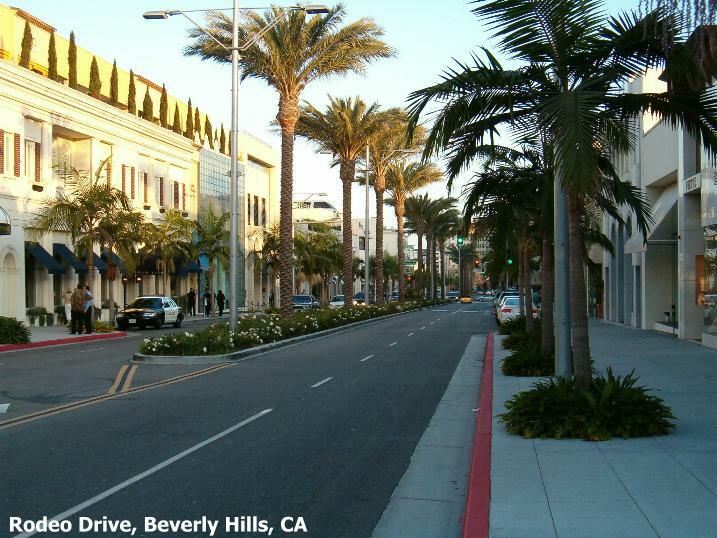 You can opt to get off at Rodeo Drive if you choose and then catch a later bus. 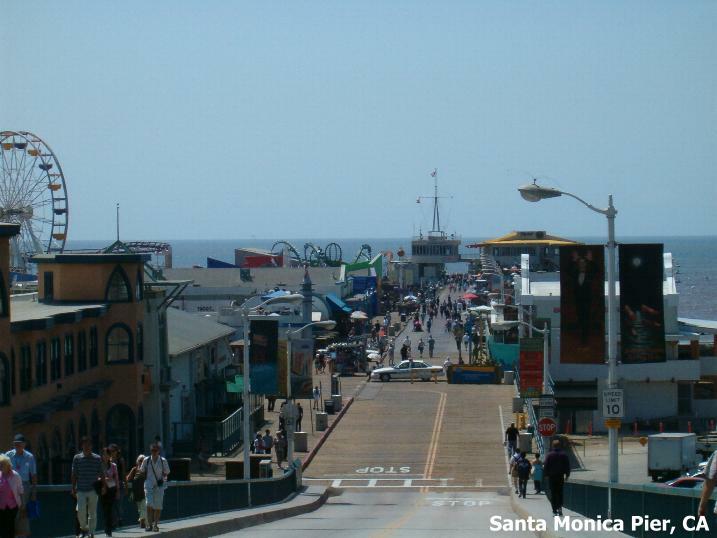 The Santa Monica Pier is a landmark and is fun but not at spectacular as I had imagined. 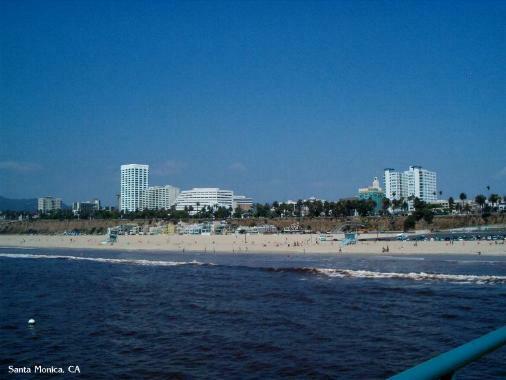 The view of the shoreline from the pier is beautiful. However, horrifically, the water is a dark brown and doesn't look at all appetizing. The next day I was off to Universal Studios, easily reached on the subway just a few stops away at Universal City station. Just follow the crowds diagonally across to where the shuttle will pick you up and drag you up the steep hill to the famous theme park. 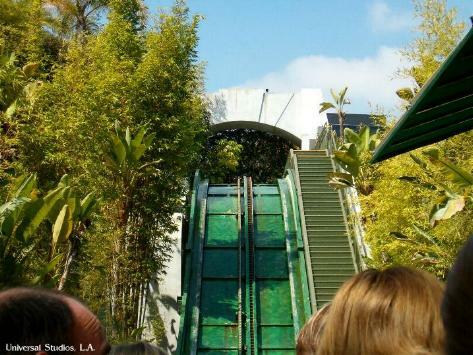 This was the most fun I had on my trip and I took my first ride on a little rollercoaster on the Jurassic Park ride, and I also did the Back to the Future ride which was excruciatingly wonderful. 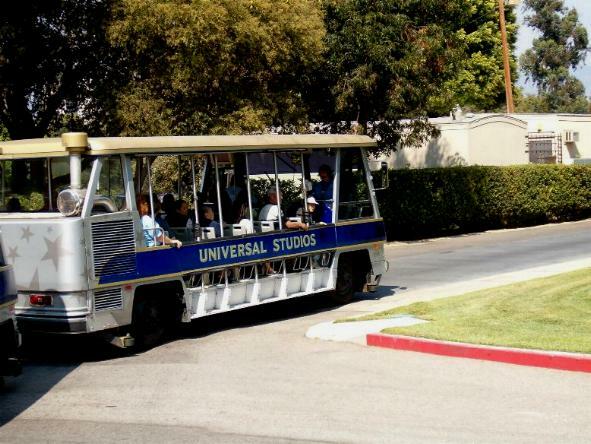 The studio tour trolley is a must and was a lot of fun and extremely interesting for all movie buffs. 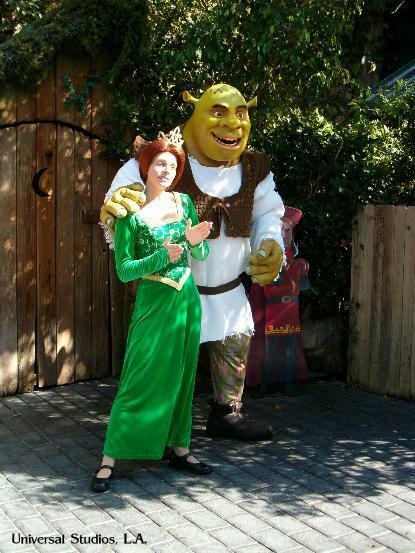 The Special Effects show at Stage 30 is also very worthwhile and very funny. 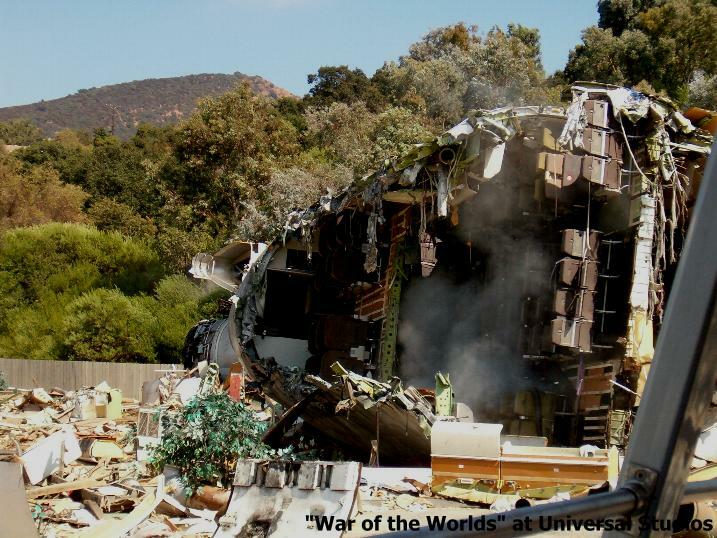 $53* for a day pass to Universal Studios. Definitely worth a visit but make sure you have enough time to dedicate to seeing as much as you can. You can also buy an All You Can Eat Pass for $19.95* (plus tax) and you can go in and out of the participating eateries as many times as you like! On the whole, the Los Angeles bus drivers were extremely helpful and courteous. However, I also noticed that a few of the female drivers were exceptionally abrupt and rude to passengers, especially the one who sighed deeply and audibly when she had to stop for longer than usual to pick up a passenger in a wheelchair. However, touring around this expensive and large city by bus (for two days) was inexpensive and great for sightseeing. 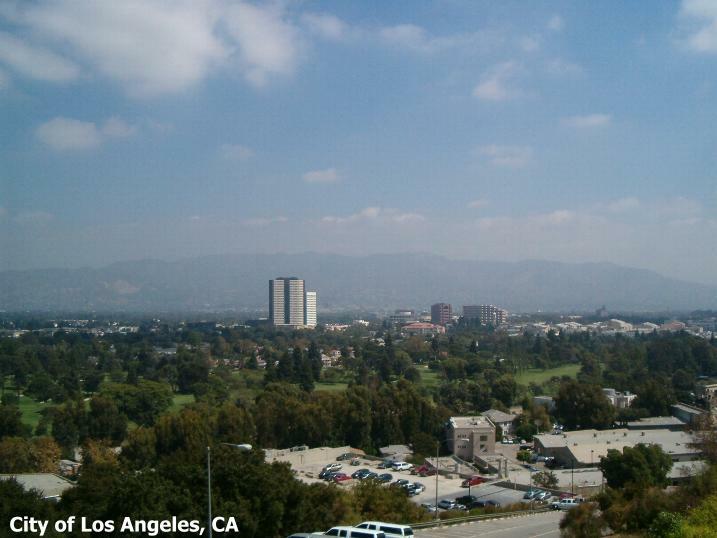 The weather in Los Angeles was clear and warm. Go to the Metro website of the Los Angeles County Metropolitan Transportation Authority for more information on fares and routes - you can use their trip planner which is useful. Or telephone 1-800-266-6883. 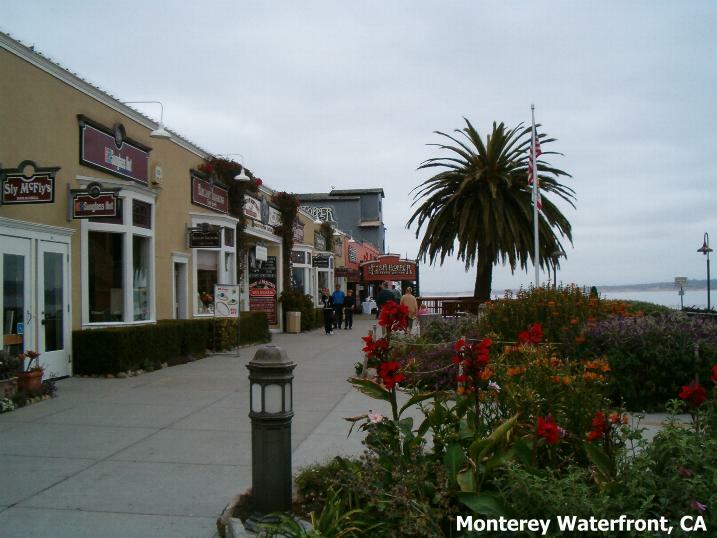 My next leg was a trip to Monterey on the Coast Starlight train (make sure you reserve your bus ticket from Salinas to Monterey when you book this next leg) which was spectacular. I sat on the left side of the train and enjoyed the sumptuous views of the California coast. There was ample time to take the subway to Union Station to make the 10.15 am departure but make sure you are there about one hour ahead of time so that you can get your ticket and stand in line to board the train - it's worth getting ahead in the line as then you will more than likely be able to get a window seat. The Amtrak crew were wonderful and very helpful and friendly. 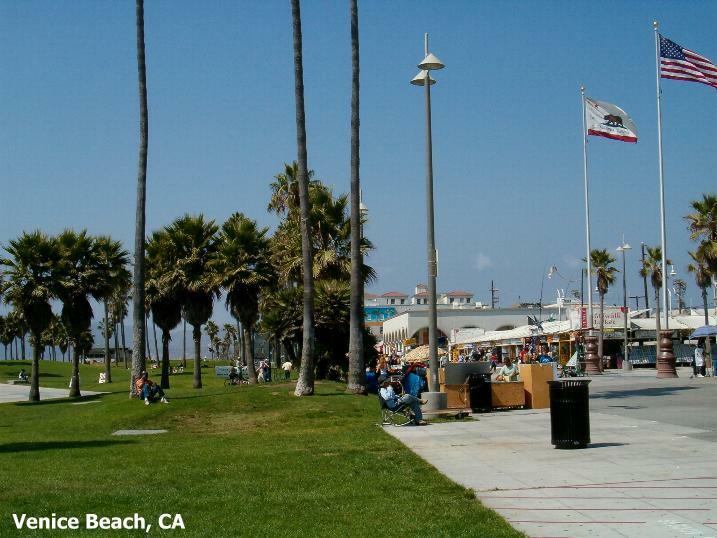 This trip is just over 8 hours long and offers a relaxing trip with stops at Santa Barbara where you can get out and stretch your legs. This is probably a good time to have lunch on the train. The coffee on board the train is pretty strong so, if and when I caved in and bought a cup ($1.75*), I drank half of it and then filled the cup up with ice for a cool drink later. Although the scenery is pretty, this trip is a long one so perhaps a book to read would be a good idea. Passengers in the sleeper cars can enjoy a wine tasting session along with a little narration. Three wines per day are offered along with cheese and crackers. Before long you start to notice the incredible farms with precision rows of vegetables - I couldn't always make out what was growing but I seem to think some were cabbage farms, broccoli, lettuce, and every square inch is utilized. 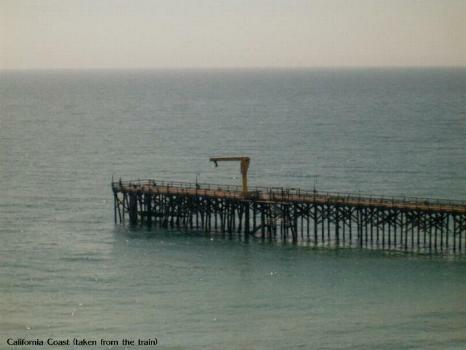 Further north there is another stop at San Luis Obispo where you can get out and stretch your legs out on the platform. It's a short stop so don't wander off. We arrived at Salinas an hour late (this train is nicknamed the Coast Star"late", and for good reason) but our shuttle driver David, had waited for us. The short drive to Monterey was enjoyable as the sun was setting and you could see the huge mountains above the coastline and the fertile valley east of them. David very kindly dropped me off at the Motel 6 after dropping everyone else at various stops, including the Transit Center (in case you needed to take a bus elsewhere), and on his way home. Once again I stayed at the Motel 6 which in this case, was a little far out of the center of Monterey, so I took a number 9 bus into town (buy a Day Pass on the bus for $4.50* and also get a System Map which is very helpful to plan bus trips) as each bus ride will cost you $2.00* which can add up quickly as the bus system is pretty extensive, if not a little eratic, and you can really get around nicely. You change to a number 1 bus (it's sometimes a little confusing to actually find where your bus stops and starts but once you do, it'll be a piece of cake) to the aquarium. 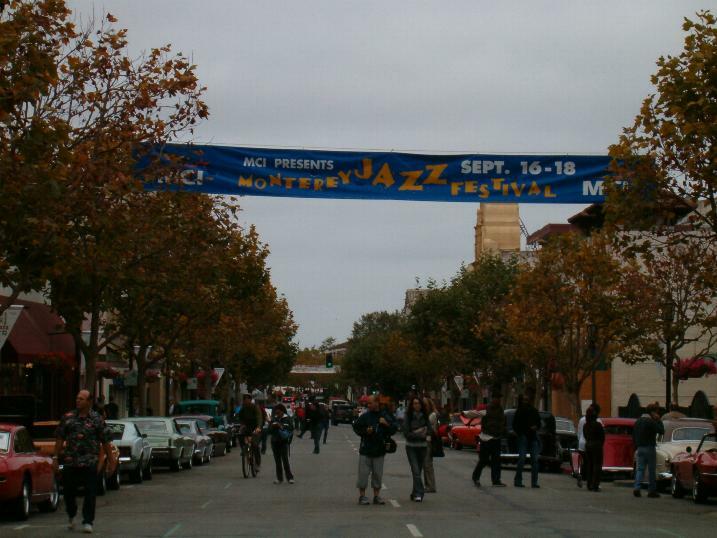 (Monterey-Salinas Transit). 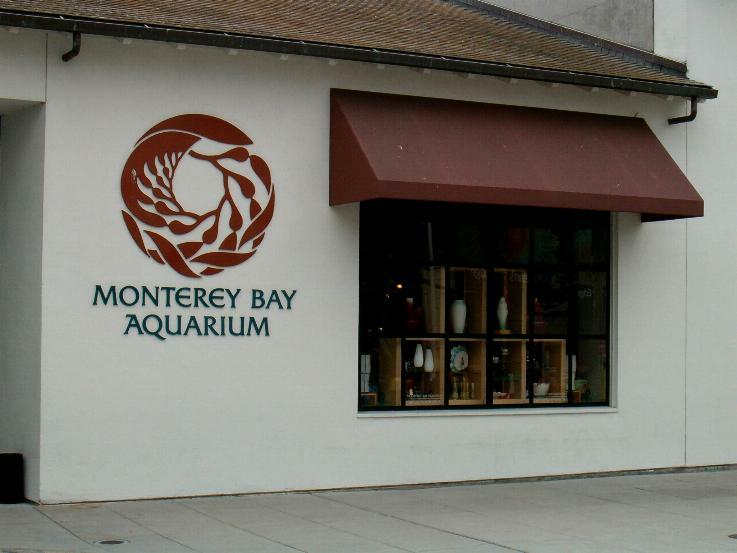 I was up early the next morning and headed off to visit the world-famous Monterey Bay Aquarium which is located downtown and virtually on the water. Entrance for adults is $21.95* which I thought really expensive as it's not that big and doesn't have that many varieties of fish. It is pretty though and kids should enjoy themselves - $10.95* 3-12 yrs. From here I walked back along Cannery Row for a while and looked at the quaint shops and restaurants. 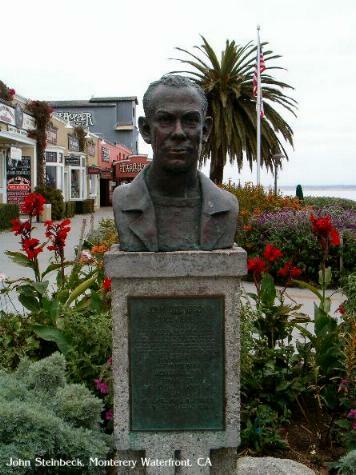 This is John Steinbeck country so be sure to look out for the statue and bust of him. Be sure to go and check out the Cool Cat Cigars shop where you'll see all sorts of cigars in different "flavors"! From here I took the bus back to the Transit Center and took a number 4 (or 5) bus to Carmel, a place I have been wanting to see for many years. 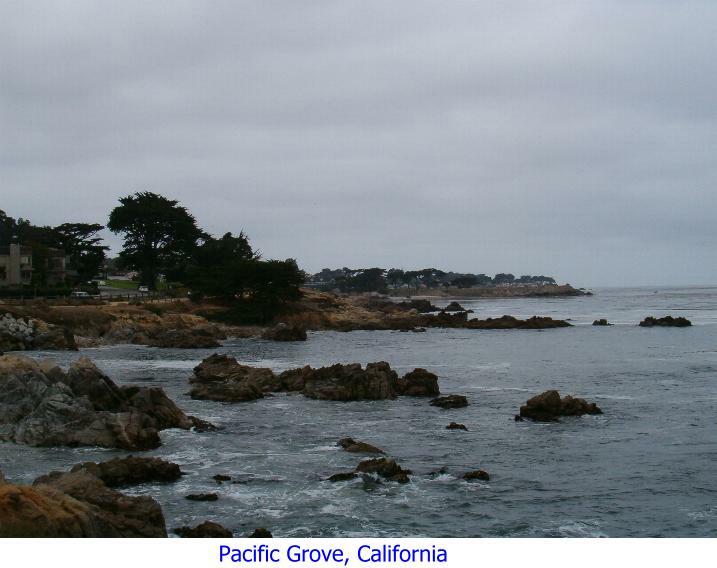 I just wish I'd had more time (I had two nights and two days) to also take the 17-mile drive around the Monterey Peninsula. 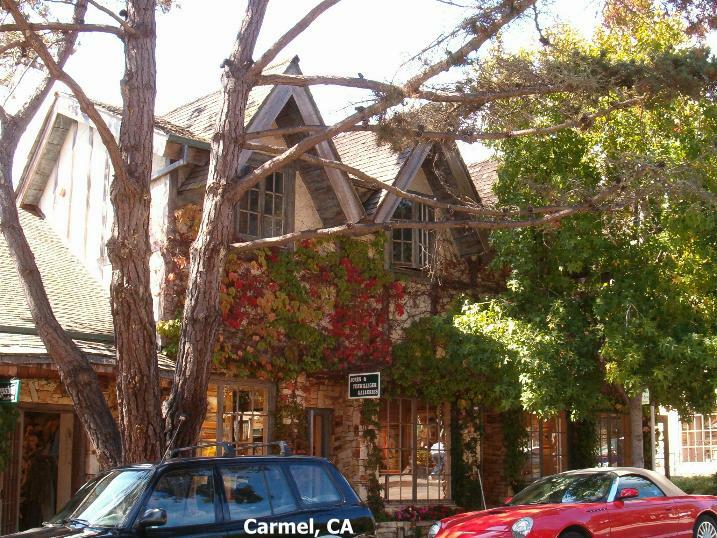 Carmel is such a gorgeous little place with the cutest homes I've seen. 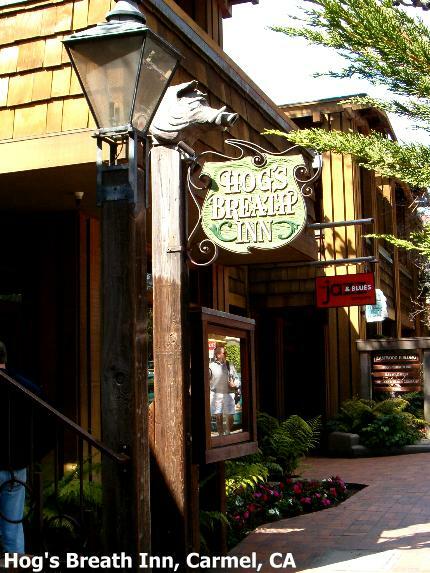 I went to Clint Eastwood's Hog's Breath Inn for lunch. It's a charming in- and outdoor restaurant (casual) with huge fires roaring outside. I also walked around a couple of streets and enjoyed the village-like appearance of this lovely place. 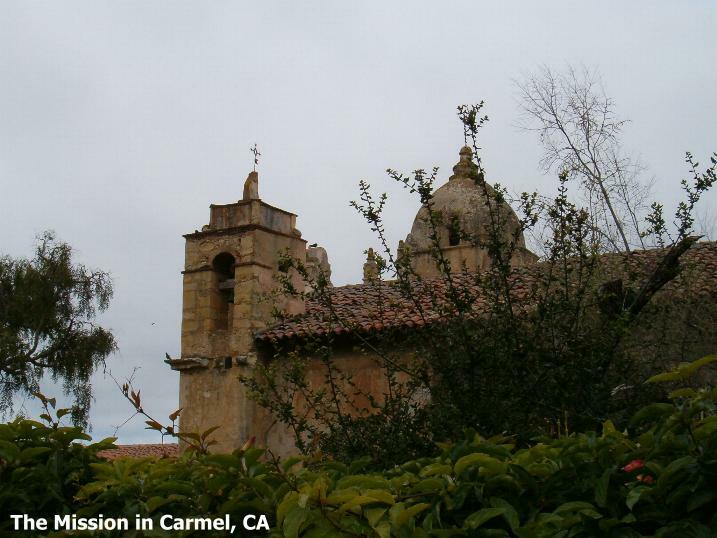 You can continue on the bus down to the Carmel Mission or walk down to it which is what I did - I got to see some of the homes in Carmel. Unfortunately this historic and famous Mission was closed (15 minutes before I got there) as they were readying themselves for a function. 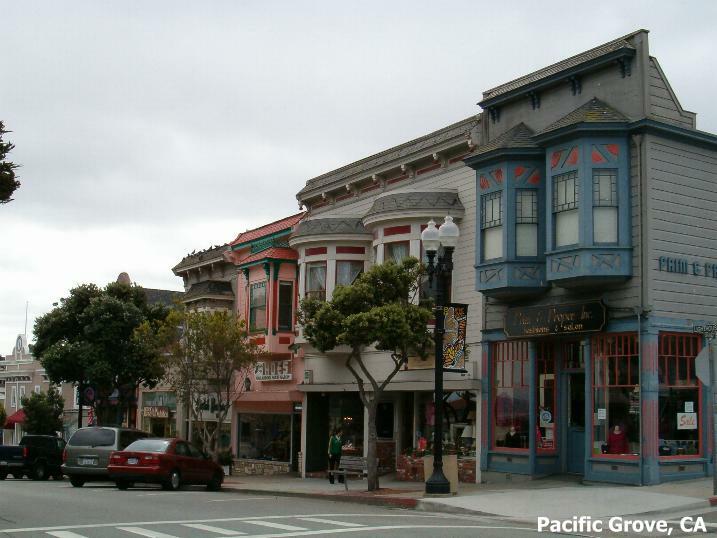 On the second day I walked from the Aquarium along the coast to Pacific Grove, home of the Monarch Butterly invasion once a year. 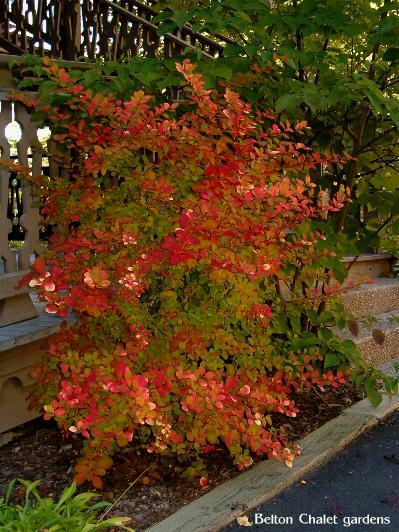 A gorgeous walk with beautiful homes and a peaceful setting. 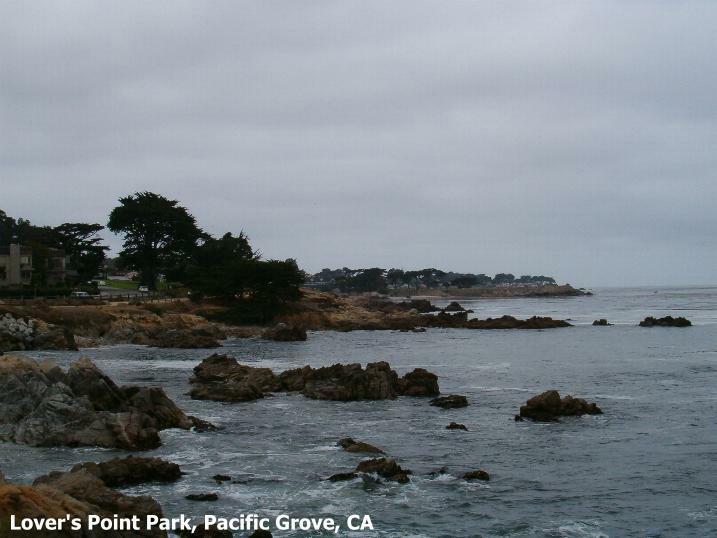 You can see Lover's Point - the walk is about a mile and a half and very easy. There is the Butterly Museum to see here as well. Lunch was at Aliotti's at 541 Lighthouse Ave, in the form of a delicious late breakfast. Back to Monterey, and there is a library near the Transit Center where you can check your e-mail, and then back to the motel to pick up my things. While waiting for David to pick me up at the Transit Center (that's where he said he had to pick me up for the return journey) to take me back to the station at Salinas, I dragged my case around with me and walked up and down Alvardo Street to look at the wonderful collection of old cars which was fun - this was Friday 16th and the start of the Monterey Jazz Festival. Although there is so much to see and do here, I felt I accomplished want I wanted to. I did waste some time waiting and waiting for buses however. David picked me up at 5.20 pm for the drive back to Salinas to meet the Coast Starlight northwards to Seattle, WA, at 6.36 pm, only to discover the train was running 1-1½ hours late - we eventually departed 7.55 pm. About 45 minutes into the journey you may experience a heady garlic aroma. This is because you are passing the town of Gilroy, the Garlic Capital of the World! (see my book review). I was tired from the busy two days on the coast and luckily had a good sleep. I woke up at 6.15 am (missed northern California as it was nighttime) and was told that we had stopped just outside Chico two hours ago! We should have been into Oregon at this stage. However, there had been a freight train derailment between Chico and Redding and so we waited and waited. 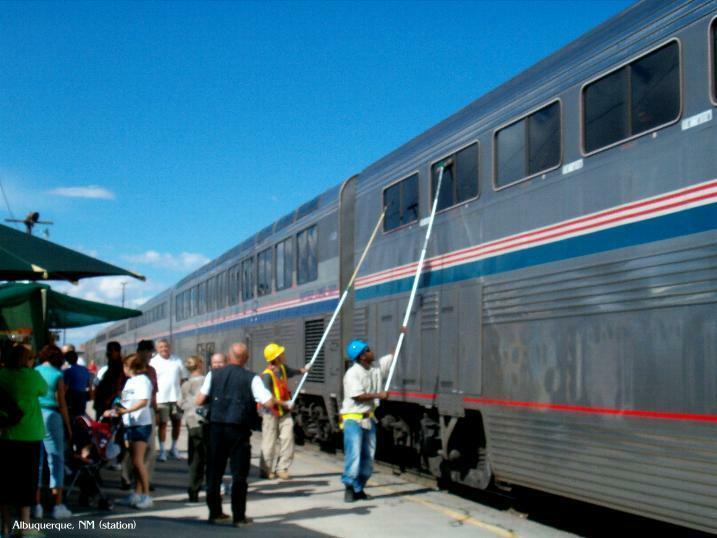 We were stuck there for six hours while they took care of the problem - they had to transfer the passengers from our train by bus to the southbound Coast Starlight stuck outside Redding, and vice versa. I cancelled my hotel stay in Seattle. We all piled into buses and started to journey north at 11.15 am and arrived there at 12.55 pm. The luggage was delayed (a big reason I only take what I can carry to avoid these kinds of delays) so we had to sit around and wait until our 4.15 pm departure! A 12-hour delay! There was a change in plan in that we would terminate this train at Portland, OR, to enable buses to ferry people to where they needed to go, and to get those going to Seattle and further, on their way. Because we were on the southbound train, now going northwards, there was very little in the line of food. I noticed that we had the same crew I had a couple days earlier en route to Monterey - they looked shattered they were so tired but they were brilliantly helpful and comforting. Arrival in Portland was at 5.45 am and we were then put onto buses and sent to our various destinations, departing at about 6.30 am. We were given a muffin and orange juice and some water for breakfast and were soon trundling up the Interstate. It was nice and green but foggy. I have to say that nobody really complained or made a scene about this horrible delay - we took it in our stride. Upon my return home, I was called by Amtrak and they apologized for this delay and offered me an $82 refund to put towards another train trip! We reached Seattle around 9.30 am, a nice 3-hour bus ride, so I checked my luggage in at Union Station, washed my hair in the ladies' restroom (no easy task doing it in the hand basin), and went on foot to explore what I could of this pretty city. 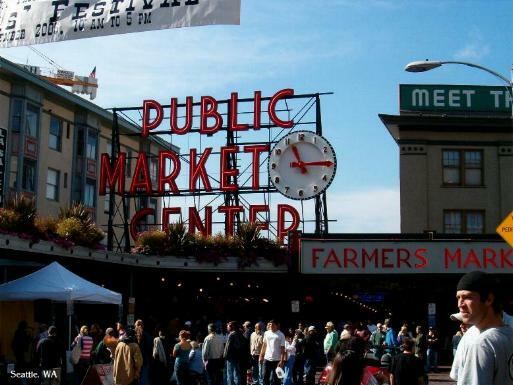 I had cancelled my hotel earlier (you are scheduled to arrive in Seattle at 8.30 pm and I would have spent the night in a hotel) and so I went in search of the Space Needle but ended up walking around the Pike Place Market (you've got to see this) and First Avenue. 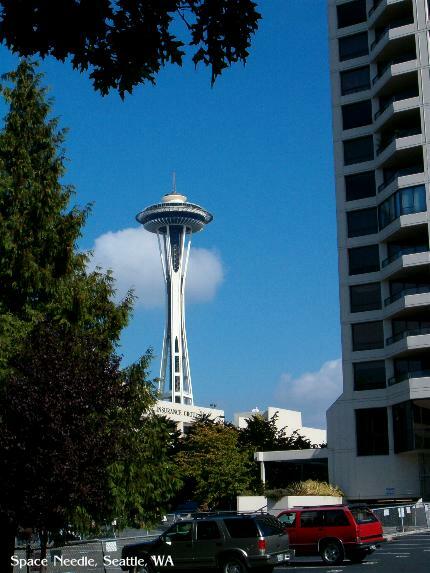 I did get to see the Space Needle from afar, as I wasn't going to spend money on buses, it was so rushed and I hadn't had time to plan any sightseeing. Besides, I was so tired, I thought the walking would do me good. The Qwestfield Stadium is opposite Union Station and the Seattle Seahawks were playing the Falcons (Seahawks won 21-18). 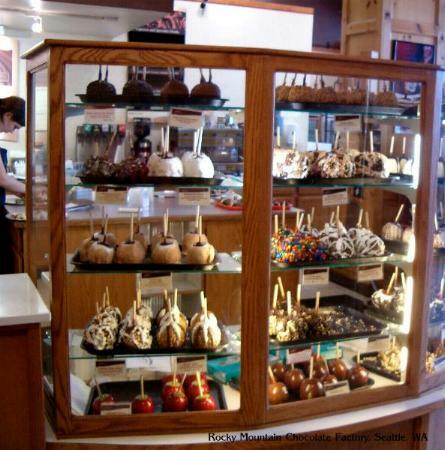 You have to go into the Rocky Mountain Chocolate Factory and see what's on offer. I would have loved to have been able to take a ferry across the large expanse of water - lots of boats working hard and a cruise ship in the harbor. Perhaps next time. The weather in Seattle, incidentally, was beautiful and clear. Departure for my next leg on the Empire Builder (to Chicago) was 4.45 pm and this is one of the most gorgeous places for scenery so if you can, sit on the left side of the train. You just cannot afford to nod off until it gets totally dark outside - there is so much beauty to see. For the first part you travel along the coast which is fantastic as the sun is low and the light superb. Then you climb into the Cascade Mountains and I saw the western side of Mt. Rainier's. The National Parks have guides narrating the history of the area which is very interesting and illuminating. It's a good idea to change your clocks once it gets dark, especially if you have to get off early in the morning - you don't want to miss your stop because you think you still have an hour! After dinner with three strangers (Pot Pie and salad and coffee for $12.50*), I fell asleep but was woken at around 1.15 am with someone across the aisle crunching on chips and crackling the chip bag - I wasn't amused. I woke up again around 6.00 am and charged my camera batteries in the restroom downstairs while I was brushing my teeth and washing my face. We had a stop in Whitefish, MT where you can get out and stretch your legs. It's a long wait between stops, with Spokane, WA being the last one in the middle of the night. Even though it was September, it was a lot colder this far north so make sure you bring along a warm jacket. 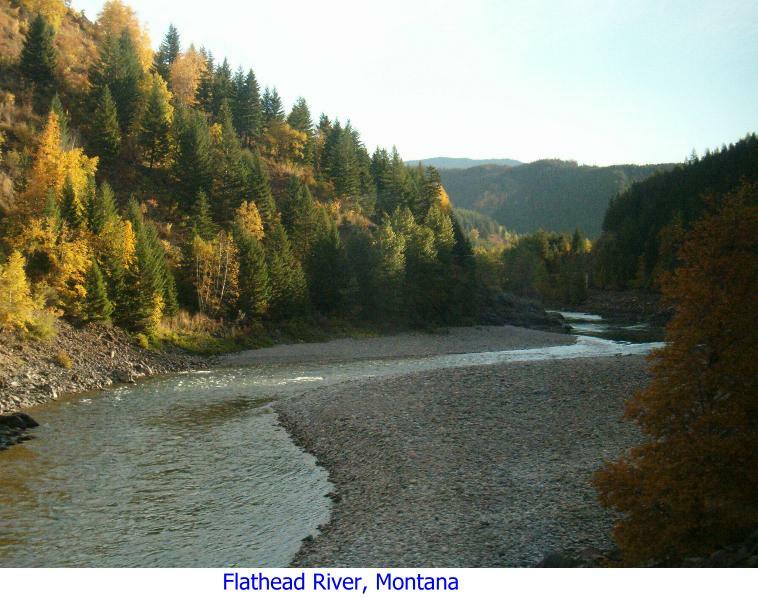 You follow the Flathead River for some time and the scenery is just breathtaking. Just before my stop in West Glacier, MT, there was an announcement that they were looking for the one passenger getting off - someone had taken my ticket from above my seat and they couldn't find me. 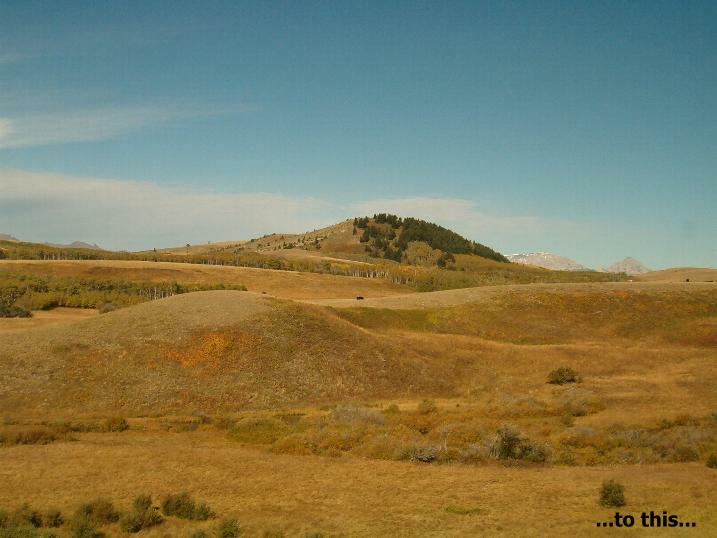 I made myself known and gathered my belongings and stepped off the train and was surrounded by the most wonderful vista - the Rocky Mountains and lots of green trees. My stop was West Glacier but the old name of Belton is still the name of the station. 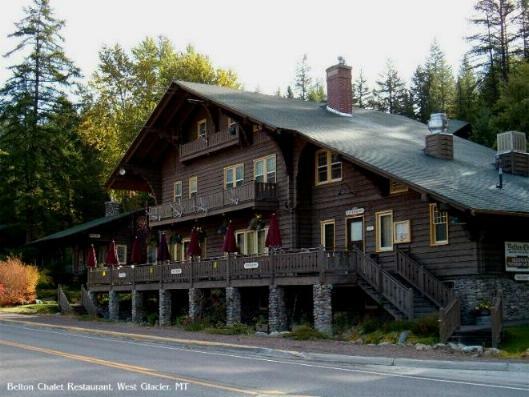 I walked across the road to the famous Belton Chalet Hotel where I was staying for the night. The air was crisp and clean and I felt a spring in my step. This old hotel is full of history and is absolutely charming. There are no telephones in the rooms and neither are there any televisions. It's been restored to its original self. I thoroughly enjoyed a good shower as it had been a while with all the delays back in California. My hotel faced the back so I didn't have a good view but a walk around the grounds afforded me the magnificence of the mountains. This was around 9.00 am and I headed to the dining room to see if there was any coffee left over from breakfast and to my delight, I was invited to have some breakfast. 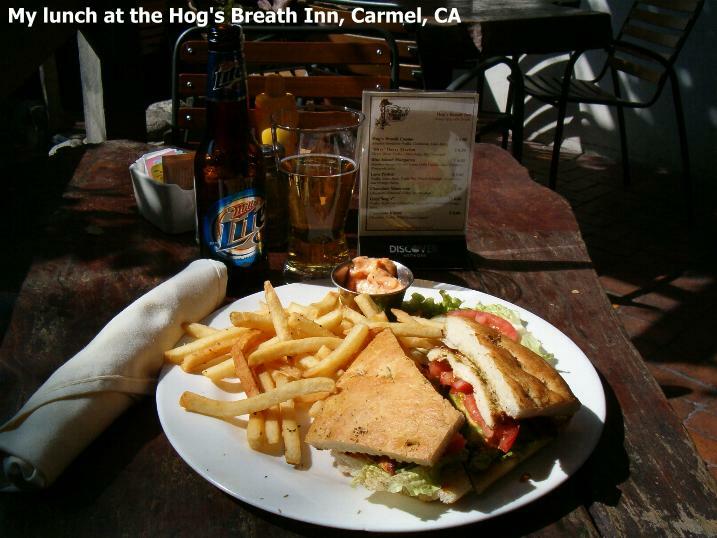 A treat with a great selection of food to choose from. I went for a walk into "town" and discovered that all was pretty deserted as it was the last week of the season. 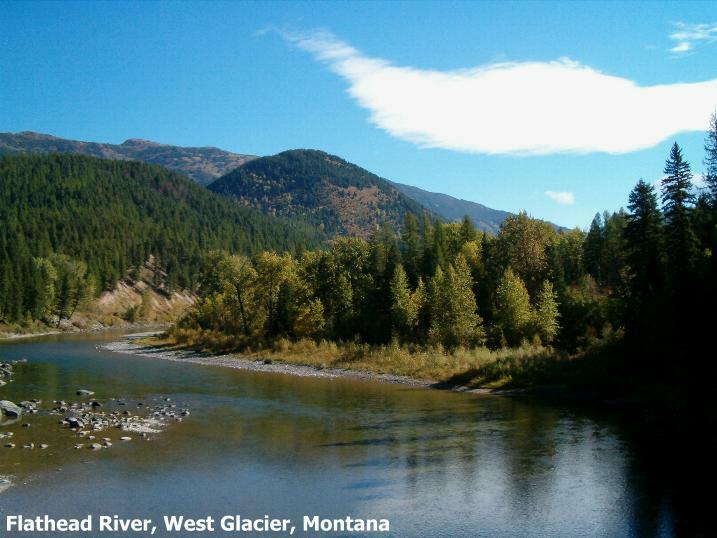 A walk across the Middlefork Flathead River was beautiful and from the bridge above, I could see huge trout swimming around in the water. The walk around was so pleasant and there is a wonderful information center (Alberta, Canada Information Centre) you can visit for brochures on tours and trips further north. I also took this opportunity to get a few supplies from the little local store. Because I only had the one full day, and most facilities had shut down for the season, I ambled around and took it easy until dinnertime. I dined at the Belton Grill Dining Room which is the building in front of the hotel itself. This was an experience as I had Montana Meatloaf (buffalo) which was wrapped in apple-smoked bacon with smokey chipotle gravy, roasted garlic whipped potatoes, and savory creamed corn. I made a pig of myself and had a slice of vanilla cheesecake with huckleberry (Montana specialty) sauce and decaf coffee. Was I full! This is such a special place especially if you want to get away and relax and unwind. They also offer spa facilities but make inquiries ahead of time. I was tired and had a great sleep in a great bed for a change. Up early with a wake-up call at 6.15 am as I had to get the sister train to Chicago at 8.15 am. But not before I had a good breakfast of granola, yogurt, coffee, berries, fruit juice - you'd think I'd still be full from the night before! I strolled over to the station and chatted with a few other waiting passengers and only then noticed how cold I was and that my little jacket wasn't really warm enough. Thankfully though, the train wasn't more than 10 minutes late and you could check out the inside of the station to keep warm. Investigating activities ahead of time is a good idea. Visit Sun Tours for information on what's on offer in this area in season. Getting into a warm train was wonderful and the scenery is not to be missed. Firstly, let me tell you about a couple of people who grossed me out just after boarding the train. Two elderly men, sitting on opposite sides of the train and in front of me, started their ablutions in their seats! One started dry shaving right there and then while the other one proceeded to cut his fingernails. I really couldn't believe I was witness to this horrendousness - the bathrooms are just down stairs and as far as I was concerned, this was just plain disgusting. 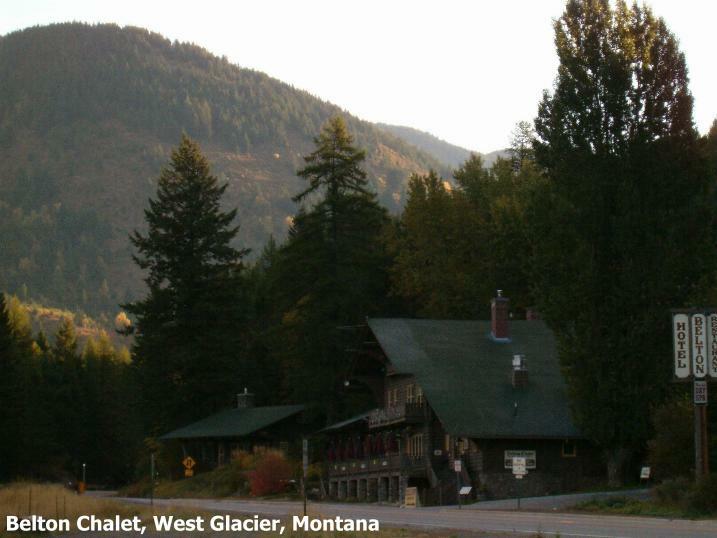 However, I tried to avoid them and enjoy the views which came to an abrupt end just short of two hours from West Glacier. We stopped at East Glacier to pick up a few passengers and from then onwards, the scenery was flat and dry, yet still fascinating. This is a long stretch of rail so it's a good idea to have a book to read or take a little nap. At Shelby, MT there was a crew change so we could get out onto the station where is was really nice and warm. The next stop is at Havre, MT for about 10 minutes where you can mail postcards and get an ice cream or a soda. There is also a lovely old steam engine on the platform you can check out. I was hungry by late afternoon so I went to the cafe on the train only to be met by a really grumpy attendant. I tried a cheeseburger (so I could write about it!) which he overheated and it wasn't particularly appetizing-looking. The rest of the crew were really nice and friendly I have to say. Keep your eyes peeled for animals as there aren't many - not as many as I thought there would be. I never even saw a bison. About two hours after the last stop in Montana, Wolf Point, you'll cross into North Dakota so look out (right side) for five tepees and a fort. There isn't much to see so animal spotting and "civilization" spotting is fun. The sunset is worth waiting for as the sky looked as though it had been lightly brushed across with a paintbrush. This leg of the trip is long but you can get out at Minot, ND to stretch your legs on the platform around 9.30 pm, just before you relax and go to sleep. Luckily I had two seats to myself so I could stretch out and get some sleep but yet again (and this is the exception rather than the rule), inconsiderate people. A couple behind me split up for the night, each taking two seats to sleep across, but at 3.00 or 4.00 am they were talking loudly to each other across the aisle - he had a hearing problem. Why not just get up and sit next to each and for heaven's sake, whisper at that time of the morning. I got up at about 6.00 am and discovered the bathrooms were sparkling clean - Carleen, our attendent, was fanatical about cleanliness - thank you! Breakfast was next and I was seated next to a couple from Seattle (you are seated next to other passengers so that all available table settings are used) and had cranberry juice, coffee, and three pancakes with syrup for $6.76*. Watching the sunrise from the dining car was really pretty and in the near distance you could see the twin cities of Minneapolis/St. Paul. The Mississippi River runs majestically on the right side and we had a nice long stop at St. Paul which seemed far away from the station. You can stretch out and walk the length of the platform and there is an ATM machine available. 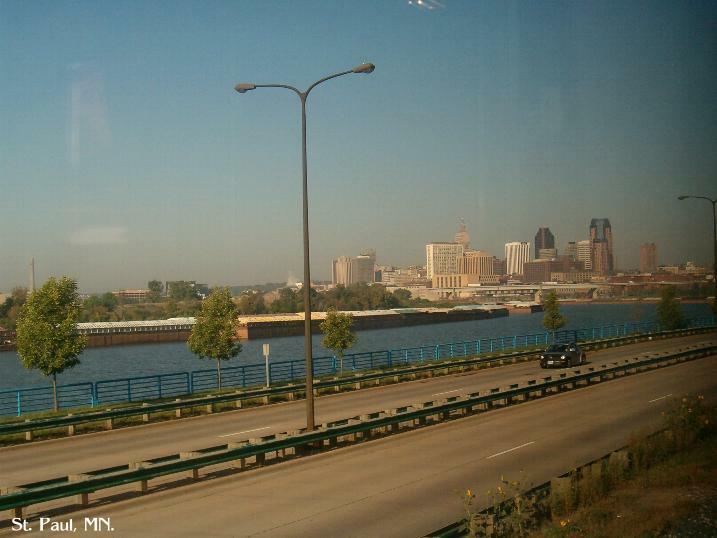 On departing St. Paul, the train travels over a raised bridge and then crosses the Mississippi River three more times. By now the scenery had changed dramatically and for the better, with lots of trees and cornfields, and watch for the locks and barges along the river. Watch out for the cutest station at Red Wing, MN and look out for the red, white, and blue boot. You get to have another stretch and walk along the platform at Winona, the last stop in Minnesota where it was considerably warmer. This final part of the route to Chicago, IL is prettier but I didn't seem to have much luck spotting (or photographing) the fall leaves, which were not in abundance. 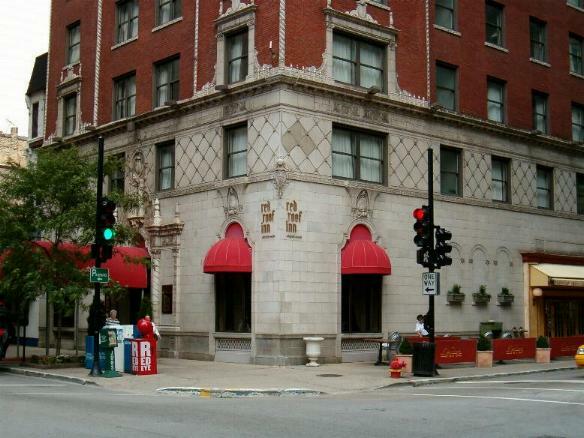 Arrival in Chicago, IL is around 3.40 pm - work your way out of the station via the main entrance and to the corner of Adams and Canal where you can take a number 157 bus to E. Ontario where the Red Roof Inn is located and where I was staying for the next two nights. A superb location as it's close to the Magnificent Mile and all the wonderful stores, and on a convenient bus route to the city and/or back to the station. When you come out of the hotel, turn right and walk to Michigan Ave (Magnificent Mile) and then turn right and walk one block to the Apple computer store where you can use their internet while checking out their fabulous iPods. The staff were really obliging and allowed people to come in and use their computers which was a wonderful service to have discovered. From past experience, the library computers in town are heavily booked and so this way, you don't have to go very far and you don't have to wait. I grabbed something to eat and then it was back to the hotel for a shower and a sleep in a bed. On television I watched in horror as the JetBlue plane landed safely at LAX after the front wheels hadn't aligned themselves. Also heard about a tornedo that blew through Minneapolis just hours after we'd passed through. It's a good idea to reserve the next leg of your train journey while you are right in the station, and physically get a ticket, so you won't waste any time doing it before you depart. My one and only full day in Chicago and I decided that I would try and go and see a taping of the Oprah show - I was in Chicago after all! I grabbed a Dunkin Donuts breakfast and proceeded to walk the 3 miles to the Oprah Show as I was tired of wasting time trying to work out bus schedules and routes. I was up early and had the time. 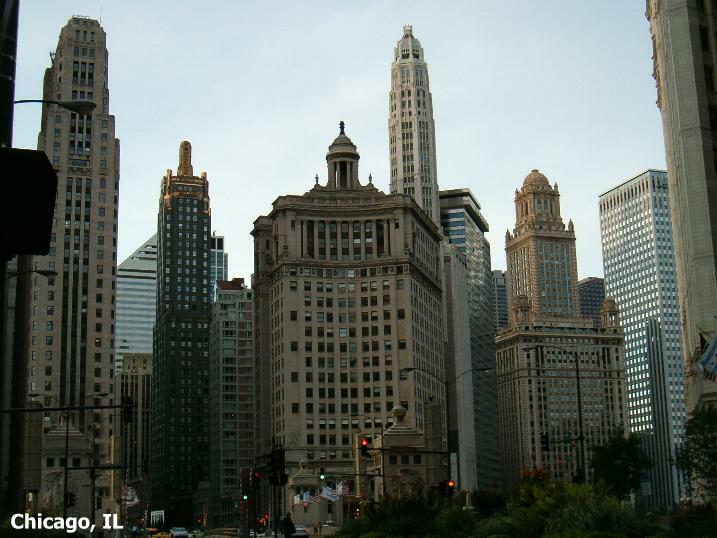 (Upon arriving in Chicago the day before, I went in search of a bus and asked a transport official if he could help me. He smiled a huge toothy grin and said, "Yeah, for five bucks," and then burst out laughing. I think he meant it but then lost his smile when he saw I was not amused and told me which bus I should take. I think he was thinking where I could go, too.) You can also take a number 20 bus on Madison Avenue up to Morgan and walk the one block to the Harpo Studios. I used the map I got from the hotel and worked my way there. (You can also print out a street map off the Internet and mark up your own walking tour.) It's such an easy city to walk around in, despite the traffic, and rather pretty with the canals and beautiful buildings. However, the Oprah Show was a total waste of time as I stood in line for three hours, got inside only to be told that I had to have had reservations - why didn't anyone announce this to us while were standing outside? So, I was then ushered aside and told they would try and get me in to the next show but after more hanging around, I was told I wouldn't be able to. Drat! The weird thing was that there were about 15 or so people from the first show who were asked to stay behind as they were going to be used to fill the empty seats in the second show. To me that wasn't fair and I trotted off back to downtown Chicago, really peed off. Apparently Donna Karan was in the first show and Carole Radizill was promoting her book in the second (or vice versa) - I found this out as I bumped into four women who were standing behind me in line and we landed up having lunch at the same place a little later. Make sure you make reservations ahead of time - perhaps visit Oprah's website for more information. So, feeling a little dejected and mad at myself, I wended my way back (the Sears Tower is nearby on this side of town), stopping in various stores for a look around. 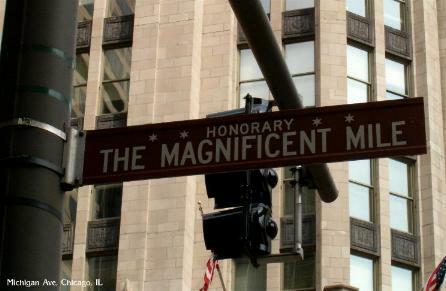 The obvious street to concentrate on seeing, as I didn't have much time, was Michigan Ave (or the Magnificent Mile) and did a little window shopping and sightseeing. The WGN Radio station has a street-level window so I stopped and looked in and saw Alan Alda being interviewed. The speakers outside weren't that loud so I couldn't hear what was being said. I guess it was a book promotion. I walked to the Water Tower and a bit further along and came across the Fourth Presbyterian Church opposite the Hancock Center. I went inside for some spiritual upliftment and also into the gorgeous little gardens. 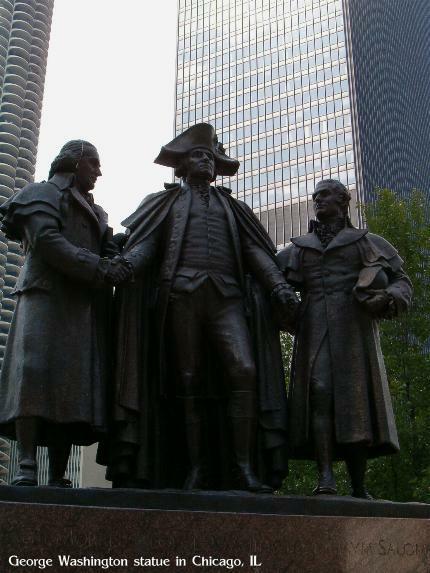 I didn't spend any money on entrance fees (I had virtually no spending money) but there is so much to see in Chicago, that I wasn't particularly worried. I walked further on Michigan Ave to Oak and turned left till Rush and then right on Rush and saw some wonderful stores, arty and eclectic. At Bellvue there were loads of restaurants, so if you want a walk to have an evening meal here, it's not that far back to the hotel. I had a late lunch at the Cheesecake Factory at the Hancock Tower and had a California Cheese Steak and instead of fries, I had freshly steamed spinach which was wonderful. This is where I bumped into the women from the Oprah Show. It was getting late so I sauntered off back to the hotel to get another night's sleep in a bed. My train, the California Zephyr, was due to depart at 1.50 pm the next day, and my checkout time at the hotel was 11.30 am (not 100% sure) so I had all morning to walk some more and sightsee a little. The buildings alone are worth walking around and looking at. I remember the joy my photographs gave me from my first visit to this city. Turn right out of the hotel and walk to Michigan Ave and then turn left and start walking. 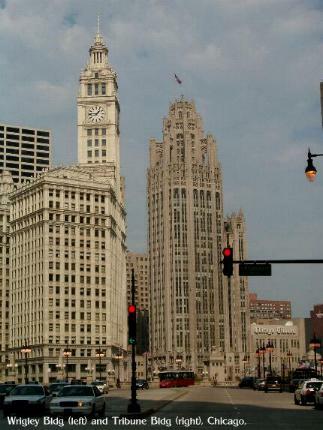 The Wrigley Building is so recognizable (as are many other buildings and bridges in Chicago) from movies and television shows. 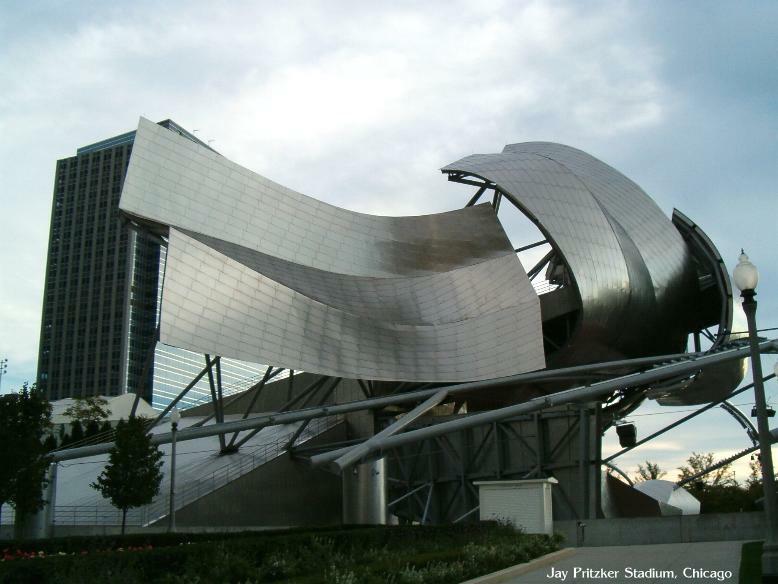 I just continued walking straight ahead and came across the beautiful Jay Pritzker Stadium and the Millenium Park which was a beautiful place to just hang out for a while. You can also rent bikes to ride around as there is so much to see in this area. See Bike Chicago for more details. 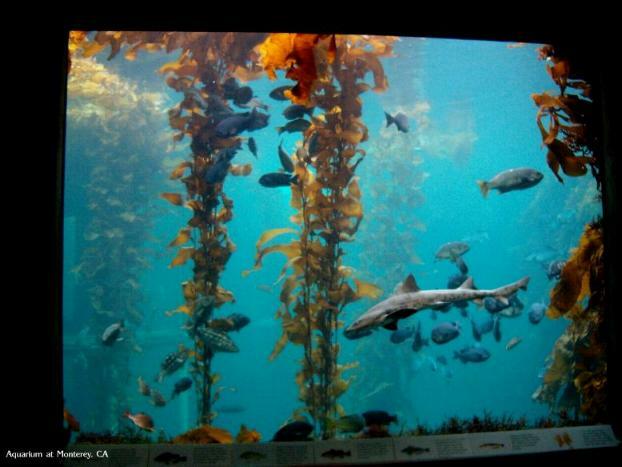 Prices are from $8.75* per day for an adult - they do have daily rates. 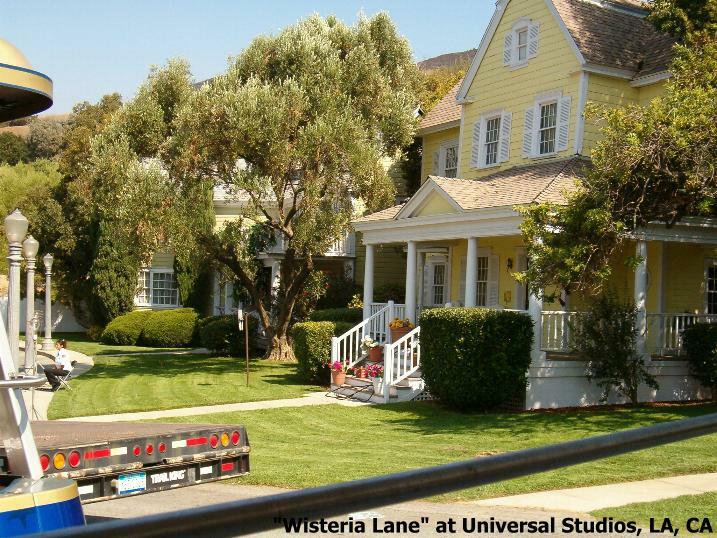 While walking around in this area, I could have sworn I saw Kate Winslett! After this delightful few hours of walking around, I headed back to the hotel, gathered my things and took a number 151 bus (on the opposite side of Michigan Ave) to Union Station. You can also take a number 157 bus. The waiting in the station was pleasant and before long we were on our way west. About an hour outside Chicago it was back to lush green farmlands. This train wasn't full by any means so I sat on the left side and spread myself out and relaxed. It was freezing cold inside the train and the first time I spotted a crew member was around 3.25 pm! - departure was 1.50 pm. She was a miserable and unfriendly person and could barely manage to smile. I told the conductor that it was really cold in the train and his abrupt answer was, "It's cold outside!" Have you ever! I didn't see her for another hour and then again at 6.00 pm when I mentioned that the interleading door wouldn't close and kept trying and trying to close itself but was just making a noise. She said, "I can't get it to close" and continued on her way. Then I noticed her answering another passenger's question and she proceeded to sit on the armrest of the seat and yak. It's as bad as a restaurant waitress sitting down at your table to take your order. There was a brief stop in Ottumwa, Iowa, at 6.40 pm where you could get out and stretch your legs and there is a nice little shop here - the next "get off" stop was Omaha, NE at about 10.15 pm. I decided to have dinner and sat with two elderly women who turned out to be 91 and 84-year old sisters. I was so impressed and they said they always travel by train. Apart from the creaking and squeaking interleading door, I managed to get some sleep and woke around 6.00 am (local time) and we were about two hours outside of Denver, CO, running half an hour late. 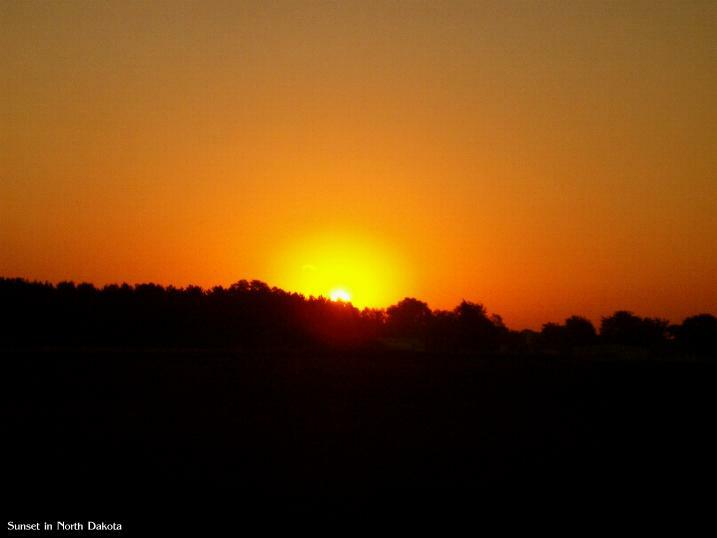 The landscape was coming to life as the sun was rising in the distance and casting a pinkish/reddish color across the plains. The coach attendent was hardly seen but she made an appearance around 7.25 am to collect the pillows. Arrival in Denver is a pretty sight as the Rocky Mountains are up close and huge. Another delay I faced was the one waiting for the connecting bus to take me to Colorado Springs - around 11.50 pm - a wait of nearly three hours! 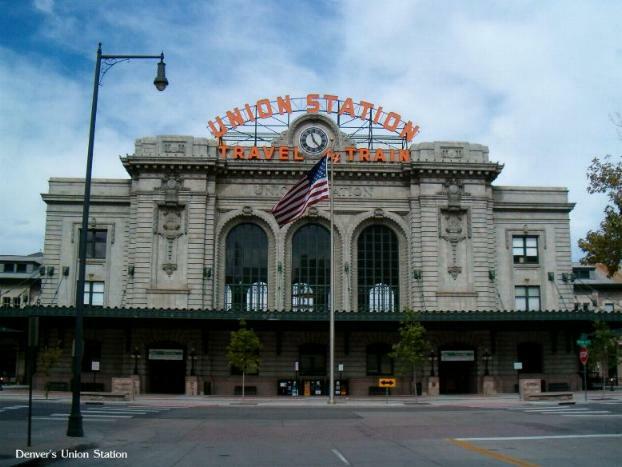 Union Station at Denver was undergoing some construction work and wasn't looking its best. The bus trip to Colorado Springs was good and soon I was back home and already planning another trip! Despite the horrible delays on the Coast Starlight train, the views and peacefulness of travelling on a train more than made up for it. Now, where else can I get to on Amtrak? 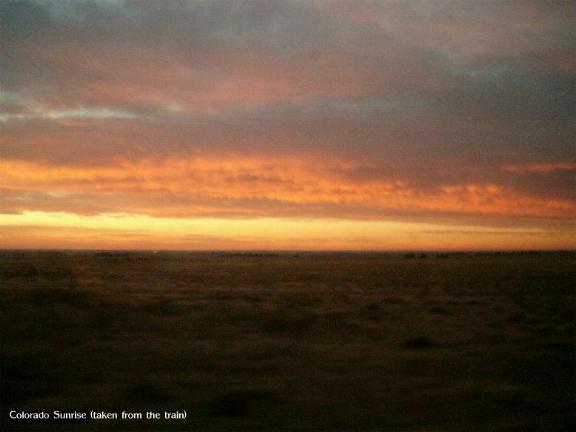 All in all, I travelled a total of 6,126 miles (according to the Amtrak timetable) and to and through 14 states. This has to be the bargain of the year. 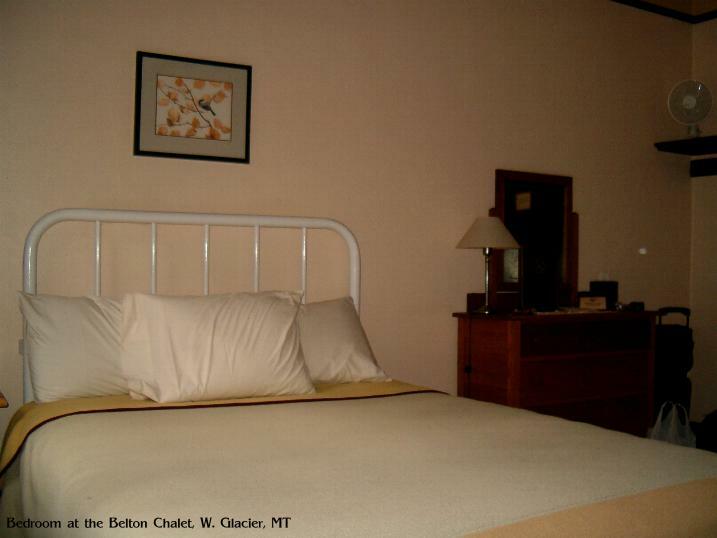 $56.99* per night (incl. 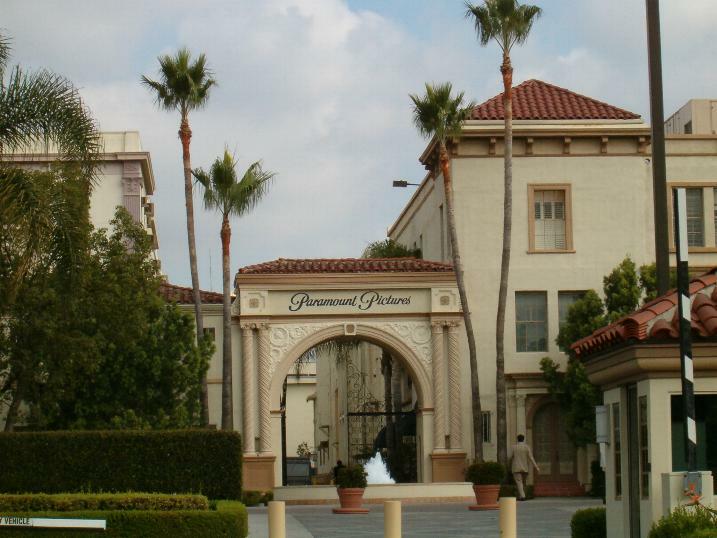 tax) in the heart of Hollywood. A few blocks away (0.38 m) from the Red Line on the subway (Hollywood & Highland), this is the perfect location for a tourist in Los Angeles. The hotel is a little rickety but just fine. 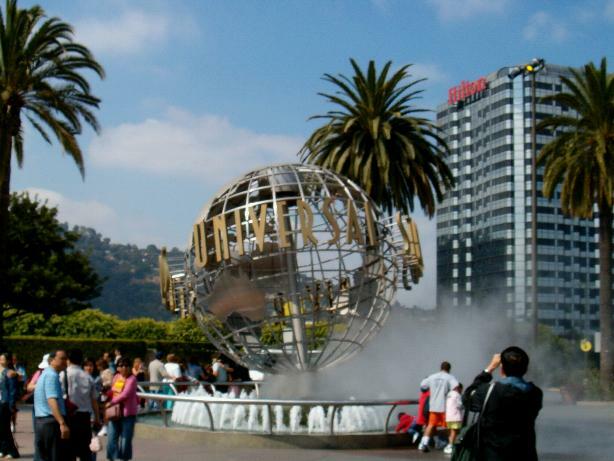 Hollywood Boulevard is within spitting distance and so is Grauman's Chinese Theatre, the Kodak Theatre, souvenir stores, the walk of fame, the subway station, bus lines, and so much more. 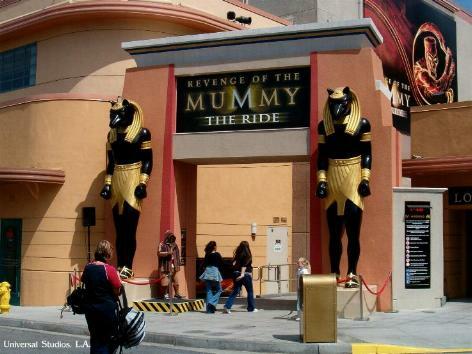 The Red Line on the subway will take you to Universal Studios and is just a stop or two away. I highly recommended using this Motel 6 - this is the third time I've stayed there and it's so central. You also get complementary coffee in the morning downstairs in the foyer. 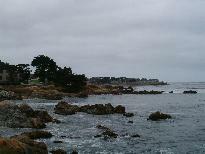 A little far out of the center of Monterey but on the bus route. Quiet setting with a pool. 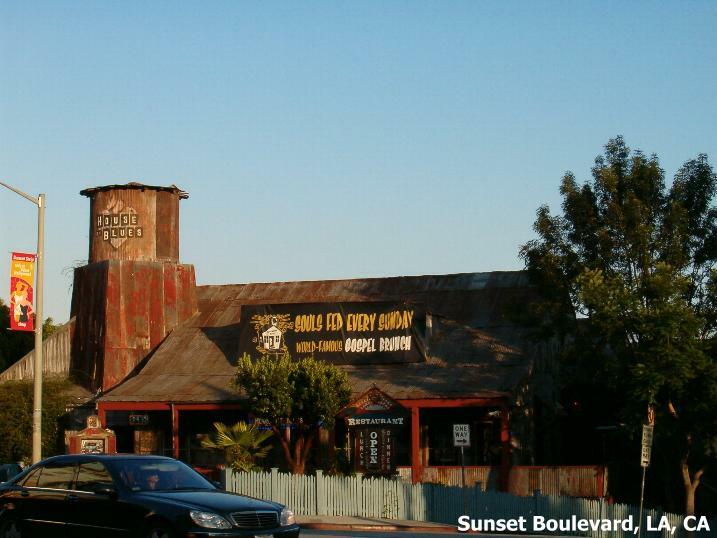 More expensive than Hollywood but adequate with friendly and helpful staff. Complementary coffee in the foyer in the mornings. $69.99* (excl. taxes) Sunday to Thursday; $99.99* (excl. 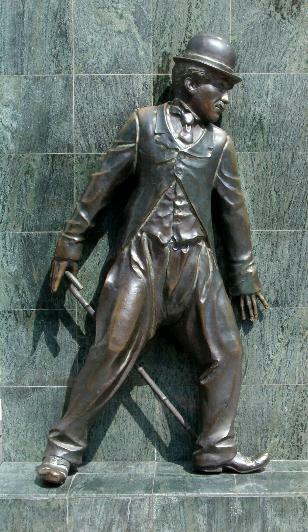 taxes) Friday and Saturday. Two Adults $75.99* (excl. taxes) and kids 17 and under stay free. Only a hop, skip, and a jump away from the Amtrak station, walking to the hotel shouldn't present any problems but you can request to be picked up upon arrival. 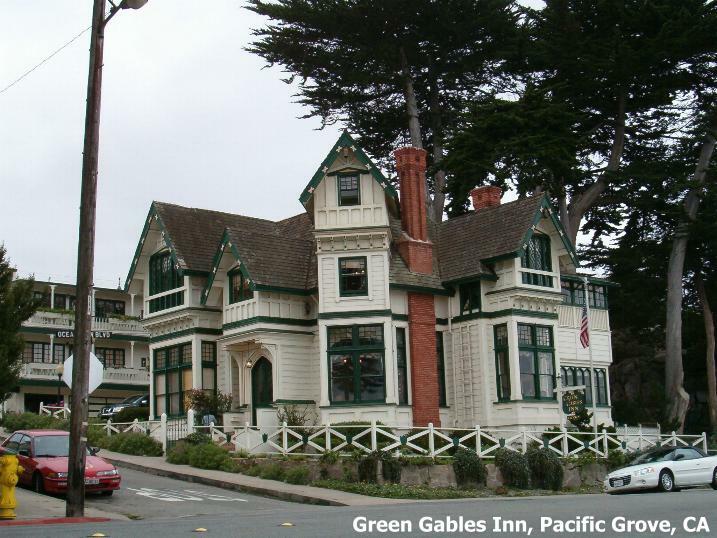 The hotel is beautiful and has been restored to its original state. 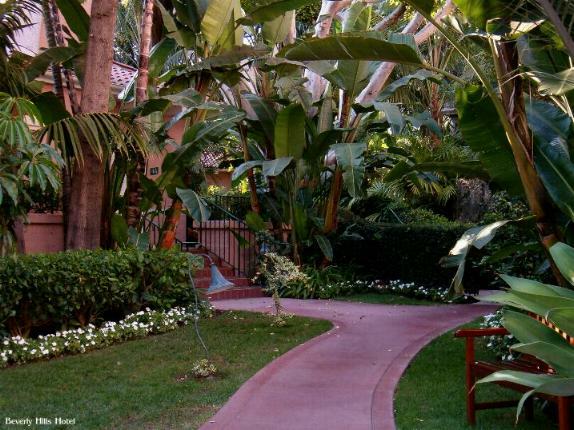 No television and no telephone in the rooms make it a peaceful and extremely relaxing hotel. 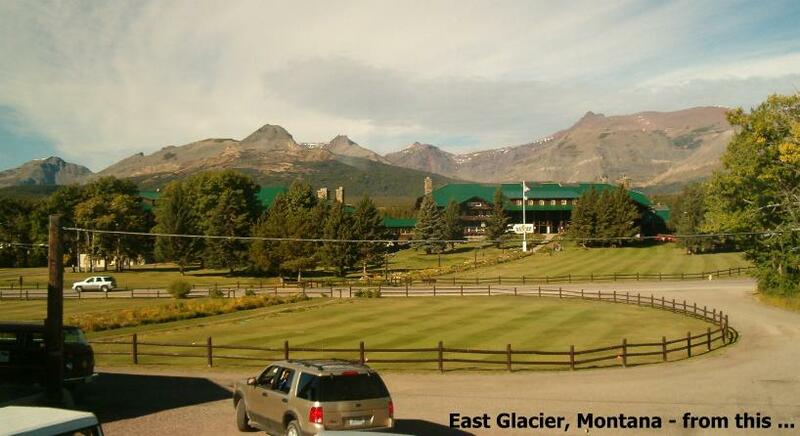 Tours to Glacier National Park can be arranged and you can be picked up at the Belton Chalet. Rooms are sparsely decorated in keeping with the theme. Lots of history which you can read about in the reception area or take a walk around the grounds and see the beautifully landscaped gardens. You can sit quietly and enjoy your breath-taking surroundings, or, take a short walk into "town" for tour information or to get something from the little store. 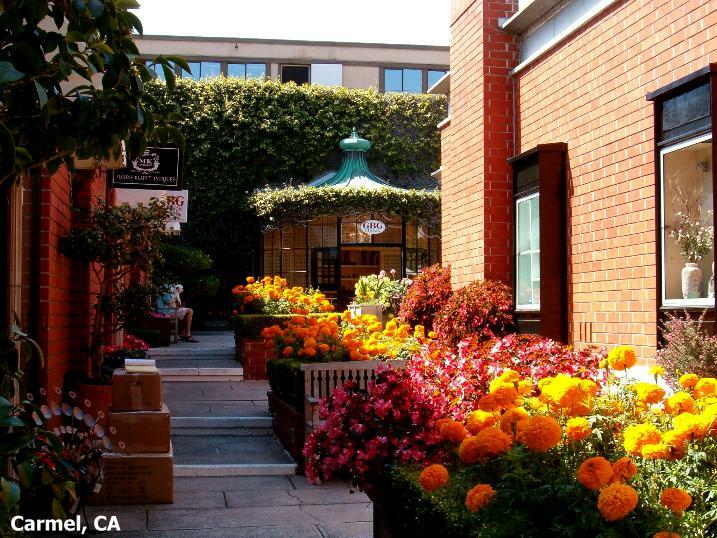 Peaceful and elegant with their exquisite restaurant on the premises. I had buffalo meatloaf wrapped in apple smoked bacon and served with smokey chipotle gravy, roasted garlic and whipped potatoes and savory creamed corn. The cheesecake for dessert (I know!) was wonderful. Breakfast is served downstairs in the chalet and is also wonderful. 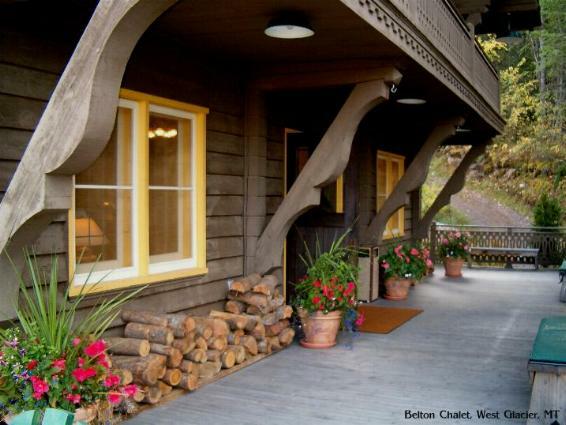 There are also two cottages you can opt to stay in, Lewis or Clark. There are also seasonal spa facilities which you should enquire about beforehand. 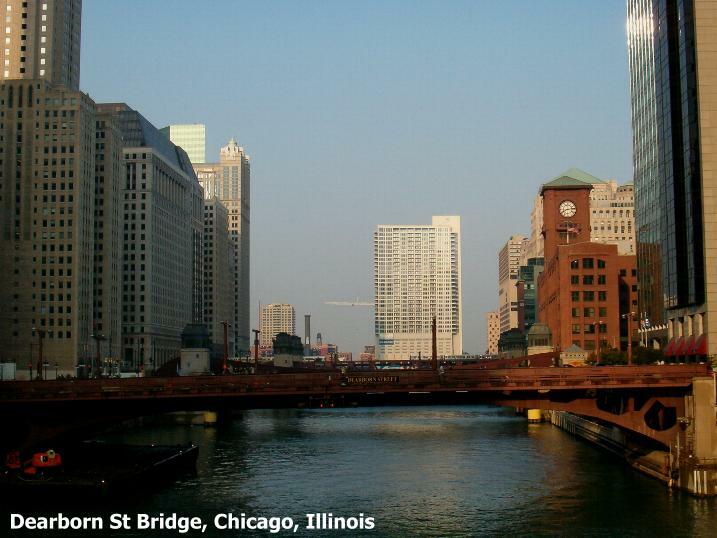 What a wonderful location in the heart of Chicago. Lovely building a block off Michigan Ave (Magnificent Mile) and on many bus routes and within walking distance of so many attractions such as the Hancock Center Observatory and the Water Tower and many top-of-the-range department stores. Go the other way and you'll see the Wrigley Building, the Chicago River, and I even saw Alan Alda being interviewed on radio at the viewing window of the WGN Radio 720am building! Handy and fabulous Apple computer store just a block and a half away where you can check your e-mail - a godsend. All rooms have a hairdryer and iron and ironing board. $109.99-$139.99* and $129.99-$149.99* depending on when you visit. 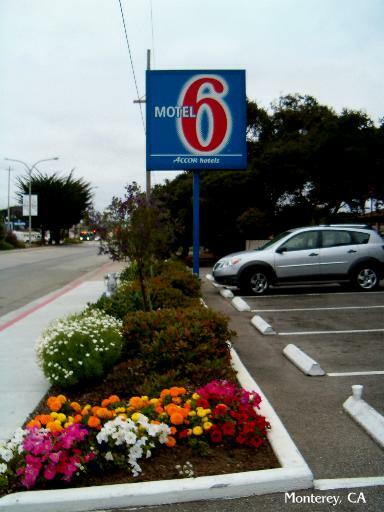 Both Motel 6 and Red Roof Inn accommodations are part of Accor. Try and plan your arrival in the city in which you are spending the night, at a reasonable hour. You don't want to be trudging around in the middle of the night, tired and laden with luggage, trying to find your way around. Choose either a chain of hotels or motels, for convenience and where possible, ask if there are any discounts for staying in more than one hotel/motel in more than one city/destination. Worth a try. 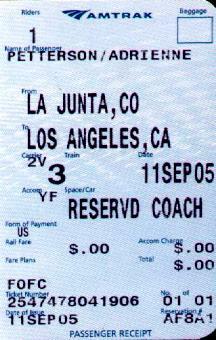 Web address: http://www.amtrak.com for all Rail Pass and routing information. Individual Amtrak train station addresses and contact numbers are available in the timetables and also on their website. Do make use of their website as you can get instant pricing on routes and it is easy to navigate your way around. Pose as many routings and combinations until you�re satisfied, and watch out for those weekly special deals! www.metro.net . Here you can plan a bus trip using their route planner, see maps, fares, and more. Warning: I've used Enterprise twice (both in Colorado Springs) and both times was overcharged on my credit card - once for the "second day" and then for a few hours over the return time. Both were very wrong as I had proof I returned the first car that same day! and therefore well before the 24 hours was up. Secondly, I handed the car in at La Junta, Colorado Amtrak Station, as arranged, at 8.00 am as my train was coming in at 8.30 am. I don't know where they got the extra "few hours" - I was aware that their La Junta office wasn't manned on the weekend (I travelled on a Sunday) and therefore left the keys at the Amtrak office, which, I was told, was routine. Both times I was refunded the overcharges. What made me really angry was the second time I made a reservation, I called an hour before I left to pick the car up, to check that they had "my" car. I was assured they had a car for me and we left for the airport to pick it up. However, I was then told at the counter that all they had was a pick-up for me. I told them I had just called to make sure there was a car and was told that that was one. They said, "We only have a pick-up, do you want it?" I couldn't believe my ears. I was being made to feel I was a nuisance when I had every right to inquire whether my car was there and to get that car, not a pick-up. This was around 3.45 pm on Saturday so eventually, someone returned a car and I had to wait until 4.30 pm for it to be cleaned and readied for me I checked the invoice (after the fact, which was stupid, I admit it), and found that they billed me from 3.47 pm (instead of 4.30 pm and they knew there wasn't even a car yet for me so how could they bill me!) to 7.00 am the next day even though I stated that I would return the car at about 8.00 am the next day (that's not even 24 hours!) as I had an 8.30 am train to catch. And then to be charged a few extra hours! Just be very careful and double check everything on the invoice before you sign it - don't worry about all the people (there probably won't be a line) behind you - they should do the same. Apart from gas being so expensive at the time, I didn't get the economical car I originally requested, got overcharged, and on top of the daily rental rate, they strongly recommended I take the insurance which was $15.99 a day - just a few bucks short of the daily rental rate. I checked with my credit card company and wasn't sufficiently covered for car rental. So, be careful when renting cars, especially ones who advertise their friendliness and helpfulness only to treat you badly and give you unnecessary aggravation and then my having to call them up and explain what their employees did and how I was treated. A pathetic apology was all I received with a promise to refund the extra charges. I wonder how many people get overcharged. It might be better to pay a little more and get better service. Watch your credit card charges, just in case. P.S. have subsequently rented from Enterprise, without incident, and in fact it cost much less as I booked online and paid only $14.24 (plus taxes) per day which was a bargain. Turns out my credit card does cover car rentals. Support your local Greyhound Station by purchasing tickets locally ahead of time, if possible, but be sure to book those bus connections in advance!. These numbers are free if dialed from within the USA. * Prices quoted were correct at the time, October 2003.